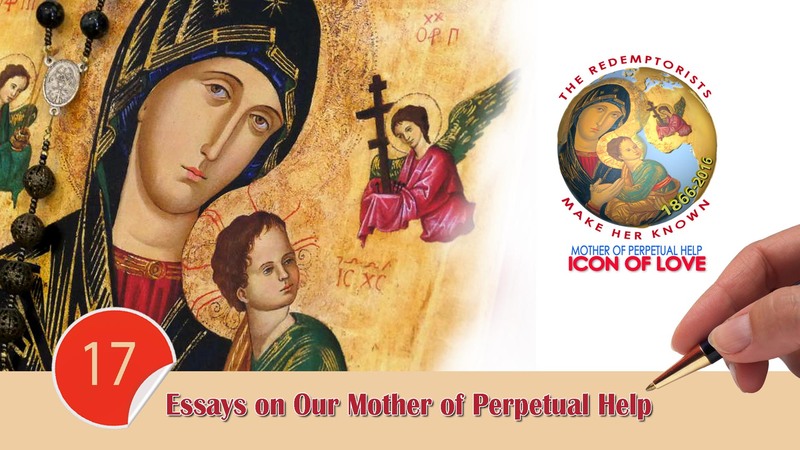 The message that most of us received regarding the icon of Our Mother of Perpetual Help is that it is devotional art. As devotional art, it can focus our attention on spiritual matters. However precisely because it is an icon it can do more than stir our emotions and direct our thoughts to spiritual topics; it can teach us about salvation, how it is worked out and its content. From this perspective, the icon is a theological source of the Catholic Tradition that invites us to reflect anew on how specific Constitutions and Statutes urge Redemptorists to live more authentically today. The person of Jesus Christ and his effect on human life are matters treated in the discipline of Christology. Christology addresses such questions as Who was Jesus and what do the titles, “Lord,” “Redeemer,” and “Savior” mean? How is a Christian to give a rational explanation of Jesus’ significance not just for Christians but for all men and women? What is it specifically about Jesus Christ and his life that makes it possible for believers to embrace a promised future state? How does Jesus’ life and message shape us insofar as living the moral life? The other approach rooted in the patristic era takes “creation is good” as its starting point. While evil does exist (expressed in such diverse ways as Augustine’s understanding of evil as the privation of the good or the dualism of Gnostic Christianity that sees creation as a contest between good and evil/God and the devil) there is the belief that evil has been overcome through Christ’s resurrection. Creation in and of itself is a good thing. The theory of recapitulation, i.e., portraying Christ as the summit of creation —as St. Paul writes in several places— positions the work of salvation accomplished through Jesus’ Paschal Mystery. Thus, much of soteriology drinks deeply from the pool of Christology. 1) What is the purpose of Jesus Christ as regards the fulfillment of God’s covenantal promise? 2) How has salvation been experienced in real, concrete ways? 3) How does the Church continue the salvific work that, in a sense has already been completed in Christ’s resurrection? Since Jesus the Redeemer is at the heart of Redemptorist life it is worthwhile to remind ourselves of recent thinking by the Church on its nature and vocation as it proclaims the salvation Jesus Christ gained for creation. Salvation is about not being alone. God made Eve as a helpmate for Adam. God chose Abraham and Sarah to establish a covenant relationship and begin a new people. It is clear from the synoptic gospels that Jesus preached God’s coming reign (sovereignty), and that it came equally to men and women who, for the most apart were alone due to sin and disease and social status. People were isolated from each other and God; this separation needed to be overcome and it was when people acknowledged a need to repent. Jesus invited people to a personal experience of God’s friendship that was a transformative experience. Jesus imitated his Father as he brought people into communion with him and each other. They were not to be alone in their sin and sickness. Salvation moved them into the community. In its efforts to bring the message of the gospel and the work of salvation more concretely into contemporary life, Vatican Council II reached into the Tradition and elaborated new avenues of thinking about God’s plan for men and women and their response. Lumen Gentium offered three insights that broaden the Church’s self-understanding as it continues the ministry of Jesus. With these understandings, the Catholic Church gave itself permission to talk about its relationship with God and the world in new ways that would help it communicate the truth of the Gospel in meaningful ways to people today. 2) The term “People of God” evokes the fact that the Church has a variety and texture that embraces the diversity of humans and the richness that is the human family. This declaration affirms that what God created and chose (these People) was “God’s People.” They did not belong to another god. The term “People of God” conjures up the idea that no longer is humanity solely the object of God’s attention, but rather they are to be partners with God. God’s choice of our ancestors was an invitation and expectation to live in ways that brought justice and peace to people’s lives. In God’s eyes, and so in the People of God’s eyes, the widows and orphans deserved attention and God’s People were to be a witness to other peoples that fulfillment was to be had, and it came in ways contrary to the ways that they experienced. Bestowing this title on the Church today has given a renewed emphasis to the importance of relationships and provided a pathway for Christians to add to discussions about the common good. While Christianity has a moral order, it is possible to rely too deeply on a literal reading of laws and ignore that the law is directed to bring people to choose what is good and true. The People of God must keep in mind that honoring God also means honoring the dignity of each man and woman by exercising justice and charity in our dealings with them. 3) A striking reordering of priorities occurred with the proclamation of the “Universal Call to Holiness.” Whereas from the medieval to the early modern period – one important focus of the Christian life was to gain protection from adversity, now there is a focus on living a holy life. (A holy life, not a perfect life.) Guided by biblical research, the Church offered a vision for all vocational understanding whereby holiness is not reserved to the ordained or religious; rather each man and woman have a call to live a life of blessing. This holy life is to imitate God’s life. One understanding of holiness is that of being set apart for a special purpose. That might include the sacred vessels or holy water. They are blessed and set aside for special use. The baptized members of God’s family are “set aside” to witness to God’s fidelity and care for us by using our resources to care for others, beginning with our immediate families. The pursuit of this holiness has grown over the decades to embrace an ethic that includes care for the earth and the environment. There can be seen a growing awareness of the interconnectedness between human acts and their potentially destructive effects, a movement that shifts us from a one-sided emphasis on the personal good to the communal good. In opening up, these veins of thought the Church provides us ways to deepen our understanding and praxis of the Redemptorist Constitutions and Statutes. In reflecting on what the Church as Mystery, the Church as the People of God, and the Universal Call to Holiness teach us about the Christian vocation we are better able to craft messages that promote communion and make holiness a motivating goal. We can now bring these orientations into dialogue with the Perpetual Help icon in order to investigate two of our Constitutions. Even though the Blessed Virgin is the largest figure in the icon she points us to Jesus, and Jesus communicates a choice to us in the form of a question, Are we willing to come to know Jesus, God’s Son? Are we willing to take up our cross and accept God’s will for us? God’s invitation to Abraham and Sarah replays itself out it in Mary’s invitation to us to know Jesus. When a Redemptorist preaches he is not only to explicitly proclaim the kerygma (speak the words of scripture), he is to do it in such a way that the poor experience Jesus as the one who enters fully and completely into relationship with them regardless of their status or other factors that might limit our willingness to accompany them. To those who are not poor, the message of any preaching can stir them to reflect on how a relationship with Jesus is a transformative relationship and must embrace a larger sphere than their personal relationship with God. A comfortable life is not to be condemned; but can we not preach to the comfortable in such a way that they see how Jesus is inviting them to enter more deeply into the “joys and hopes, griefs and frustrations” of the People of God and bring them some relief from their burdens? Regarding the poor… Jesus is for and with them, and we are to be for and with them. In the words of Gustavo Gutierrez there are conditions that keep people from experiencing their full human dignity; such conditions are scandalous and need to be subjected to a critique by the Gospel and eradicated. Preaching is the event whereby injustices are named and brought into contact with the gospel, thus advancing the cause of salvation. But for a Redemptorist the choice involves more; it requires us to ask how we form apostolic communities that are devoted to preaching and living a message that shows solidarity with the poor. We are to choose them and their needs as we decide how to use the resources available to us, and this brings us to face fears of doing without. Keeping the poor in front of us allows us to enter into solidarity with them because we keep their conditions in mind. The fruit of living with this kind of intentionality is creating a community like Jesus himself did when he entered into the lives of the poor. It is God’s desire that no one is excluded from this relationship. Mary reminds all who look at the icon that her Son Jesus is the one who eradicates those attitudes, beliefs, structures, and practices that separate us from God. 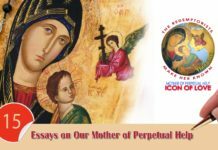 The icon of Our Mother of Perpetual Help teaches us that one concrete experience of salvation is found in the act of forming a community with those who share the same call to live a holy life. The icon of Perpetual Help gives the reader a glimpse into the future. The Logos is enfleshed divinity as portrayed by the gold color that permeates his cloak. His experience of suffering and fear, rejection and loss was real, and so was his resurrection. His life did not end with his death and crucifixion. As Jesus is the one who has overcome the effects of sin, and believers are baptized into Jesus’s life, believers can have some experience of their future in the present moment. The work of making creation anew is first directed at the renewal of our lives. Aspirational talk is not to be confused with fantasy or mere wishes. The future is not meant to be a repeat of yesterday or today; tomorrow can be a time of growth and conversion. Jesus the Redeemer stands as witness and promise of God’s coming reign where sin and violence are replaced by forgiveness, where peace among peoples and even cultures and countries is fostered. The Church has received the gift of peace through Jesus. And the Church entrusts each believer to the mission of bringing to others, especially the poor, a quality of life that is considered out of reach until God’s word is preached and effectively witnessed to. Such a life is not out of reach, but it takes people able to preach about it and live together so that it can become real. In the Perpetual Help icon, Mary indicates to the believer that the virtuous path (not perfect path) is the life that is anchored in the promise made by Jesus. She teaches that in embracing one’s vocation a Christian finds solidarity in Jesus and his community. Jesus is never alone, though he surely felt it and even expressed it in the agony in the garden of Gethsemane. Relationships, true relationships, will undergo changes and even end, but those who live a relationship with Jesus can find support and community even though life choices can put him or her at odds with family and friends. The first apostles and disciples who knew Jesus were introduced to a wider community because of Jesus. They were thus emboldened to leave the careers or work that gave them support and identity and undertake a path whose future was uncertain. Jesus brings diverse individuals together and gives them the grace to form a new community that charts a course to live in his memory and take on his work. As Redemptorists celebrate 150 years of receiving the icon, they should also embrace the challenge to use the icon to help the Congregation preach the message of plentiful redemption and the mysteries of salvation in a new key. When the Constitutions and Statutes dialogue with the icon of Our Mother of Perpetual Help and solid theology we can open up new directions to our apostolic communities and ministerial focus. When reflected on sufficiently, these experiences can result in preaching that is more relevant and dynamic, preaching that can continue the work of conversion. Set aside fifteen-twenty minutes for quiet reflection before the icon. Take the Constitutions and choose one phrase or sentence. Read it slowly a few times. Use the first few minutes simply to quiet yourself, following your breath and letting anxiety or bodily tension flow from you. Call to mind a feeling or desire you have and be present to it while contemplating the icon of Perpetual Help. Let your gaze rest on part of the icon and remain focused on that part. Don’t engage in discursive thought; don’t try to force an answer to emerge; trust the process of meditating, uniting breathing with your gaze. Keep this moment for at least ten minutes. Say a brief prayer of thanks or litany to finish your prayer time and record any important images or insights that you would like to perhaps use at a later time. Systematic Theology: Roman Catholic Perspectives, Volume 1 edited by Francis Schüssler-Fiorenza, and John P. Galvin. See Chapter 5, esp. pp. 275 and thereafter.